This means I’m fortunate to be in a pretty unique situation – knowing that Twins all over the world really are struggling with a lot of the same issues, even if they’re not aware of each other. Whenever I’ve done readings with Twins whose divine counterpart was running or avoiding them, their higher soul self has always been extremely apologetic. This part of them is invariably genuinely in love with their Twin Flame no matter what their ego self has done or said, and this Higher Soul aspect is always desperate to show them how devoted they are to uniting. It’s often been really uncomfortable to feel this deep pain as I’ve “translated” to the readee, because it truly feels like the pain of someone who is desperate to show their love, and to take away any hurt they may ever have caused. It’s became more and more obvious to me with each reading, that no matter what someone’s Twin Soul has been doing or acting like in their earthly life, their Higher Self often has a completely different take on the situation. And the biggest thing is, they are all about love. So today, the focus is on what your Twin’s higher self wants you to know. I know the idea of spirit guides isn’t something everyone is comfortable with. However, I hope you’ll give me a few sentences to “de-mystify” the whole thing considerably. What makes it seem especially “woo woo” is this idea of spirits as completely different to us, mysterious beings from a secret realm or some other “out there” perception. The truth is, spirit guides and our higher selves are just like us: souls. The difference is that they’re not living in bodies right now – they’re “disincarnate”, they exist as pure energy and not in the physical reality as souls in bodies (“incarnate”) the way we are. They’re simply like me and you, but without bodies and the complications we have with life on earth. Your team of guides are like your group of soul friends and mentors, who you made an agreement with before life. When you were also “disincarnate”. Together, you planned that they would be guiding and assisting you on your adventure to earth while they stayed behind in the soul realms (non-physical existence). You knew you most likely wouldn’t hear them or see them when you came to life, but that they’d give you guidance in other ways and help you connect with the people and situations that would get you to where you wanted to go in life – including to reconnect with your Twin Flame and help you unite with them. Your guides are always available to help you – but because of the Law Of Free Will, which means that everyone who is living on earth get to make their own choices, they don’t step in unless you ask them to. Your guides can help you more closely once you begin to ask for it. Your guides will never “give you all the answers” but they’ll help you make choices that serve you and help you live the happiest life you could ever live – that’s why you’re here. To be happy, to unite with your Twin Flame, to help others be happy, to share your gifts with others. In order to get direct help from your guides, you have to ask. Some people call this “praying”. Their own suggestion is for you to begin to meditate or journal and clear your energy regularly, because this opens you up for them to begin to reach through and talk to you, give you signs and messages and help lift your mind and heart. As little as 5 minutes a day will help you open up. Most of all they want us to know that they’re working to help us all the time, by bringing to our attention information, methods, tools and help that can get us to our goals and dreams and happiness. But once they’ve presented that to us, it’s always up to us to make the choice. They will never force us. I personally send out a request to the universe every day, calling in any Twin Flames who will benefit from my writing and the tools and methods I share. I know that many of you are here today reading this article because your guides and your soul want you to have this information – you’re here for a reason. Getting assistance on your journey helps you feel more supported and loved and cared for, and it can be so much fun – in my experience and for others who also communicate with their guides, it makes life more like an adventure. It helps uplift us out of the realm of the mundane and “difficulty” and “problems” and into the realm of “miracles” where it’s never a question of a desire being impossible, just which solution can get you there with the most joy. It’s been some of the most fun I’ve ever had, working with my guides. For more info on how to connect with your guides and find out who’s in your “team” and about your pre-life goals, including tools for how to open up to telepathy and a tool to get any being to tell you the truth – so you avoid negative influence – have a look here. The truth is, the Twin Flame connection is utter bliss. The Twin Flame connection is all Love. It’s the old baggage that’s creating problems for Twin Flames, not the connection itself. Twin Flame Ascension is a completely neutral process which is designed (and you signed up for this!) to purge out all the earth junk you took on during your upbringing, as well as any negative material your ancestors have passed down to you through your DNA. The reason for this is that those energies are blocks to love. True love. In order for you and your Twin to uncover the deep bond of immaculate love that has always existed between you, that old junk must go. Consider it an Aladdin’s cave of treasures that’s been covered up by dust and cardboard boxes. Ascension is all about clearing out the dust and boxes so the treasure that was there all along can shine the way it’s supposed to. Ascension is just a small part of the journey. It’s not what the journey is about. Running and separation are all caused by the negativity coming up in Ascension. It’s really not something that’s happening to teach you some hard lesson because the universe wants Twin Flames to suffer in order to feel love. It’s just a by-product of the old junk triggering you as it comes up to be released. In fact, inflicting suffering on us to “teach us lessons” would only cause more blocks to unconditional love and slow down our journeys… The universe and our guides would never do that. Ascension is there as a cleansing process to open you up to Unconditional Love and who you really are as a soul underneath all the earth energies you’ve taken on. You are here to awaken to that and live from that. For Twin Flames this is crucial knowledge, because there is so much focus on the negatives of the Twin journey. The truth is that you are your Twin Soul’s greatest love, no matter what’s going on in your lives right now – earth life is wearing the “mask of ego”, but the soul is unchanging and the love between Twin Flames never ends. Your bond is unbreakable. If you align with much of the Twin Flame info that’s out there, you’ll end up living this connection as if it’s a problem rather than a pleasure. The truth is, you yourself have more power in this than most realize. If you match your energy to “the twin flame journey is a struggle” that’s what you’ll get more of. Now you know that it’s not actually the whole journey but the specific part called Ascension, you know that it’s not all about pain or hurt or lesson learning or struggle. You can align with the new insight that it’s a part of it, and joyously look forward to being free of any old limitations your soul is pushing you to release. To speed up the Ascension and purification process and take the pain out of the connection, have a look at the Vibrational Alignment Program which I created along with spirit after my Twin and I reached union. Twin Flames are two expressions of the originally same consciousness – “one soul in two bodies”. As souls, it’s simple, harmonious, joyous, infinite love. What complicates things, is life on earth – the energy, patterns and ego/identity structures taken on. This, and the actions that result from it, is where the problems stem from. If you had been born in your Twin Flame’s body, with their ancestral lineage, as their gender, with their patterns and upbringing – you would be them… And if they had been born in your situation, they would be you. This might seem simplified, but it’s true. 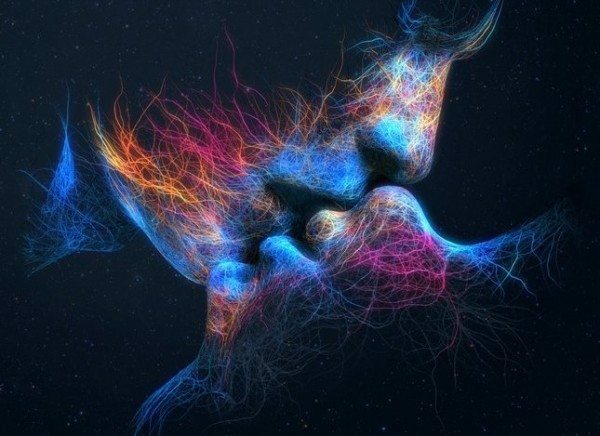 As souls, you and your Twin Flame are the two most identical individuals in the universe. You share a core frequency that no one else shares. What most often gets between Twin Flames, is perspectives, the illusion of difference. Keeping this truth in mind, helps us understand why the other has acted the way they have, and it teaches us that there is always more to a situation than we can see on the surface. This has been one of the deepest and most difficult lessons I’ve experienced myself and seen in others, but if you can open up to and sense the truth in this, your connection will never be the same again. Connecting to this insight that if you had been born in your Twin’s stead you would in essence be them, will really help you deeply forgive any hurt they may have brought to you. For me, this insight really unlocked my journey and enabled us to move past any old hurts for good. The usual earth “3D” reality of polarity and perceived separation are opposites to unconditional love. When we begin to look for the connection and the likeness and the harmony between us and our Twin Flame, that’s what we will nourish and bring out more of. Often in the Ascension process, what triggers running, separation and trouble is that the Twins are triggered by negative energy travelling from one to the other as the pair’s systems are brought together more and more. Spirit recently pushed me to create a channeled clearing track for the Twin Flame pair to deal with this – made complete with chakra cleansing, shielding, clearing triggers of running/chasing/negativity, uplifting and unifying the pair’s energies and timelines, downloading new light codes and removing any blockages in the chakra systems and between the Twins. Although life can seem hectic and troublesome with ups and downs and the drama of daily events, and the Twin Flame journey can become challenging – know that your Twin Soul’s Higher Self is always with you. All benevolent, all loving, all caring, all protective. To try to put it as simply as possible – we exist in multiple “layers” of consciousness at all times. There’s our subconscious shadow aspects, which is our low vibrational consciousness that we seek to uplift and heal to raise our vibration. There’s our earthly “ego” self, which usually dwells in the mid-range of frequencies – the so called 3D reality. Then there’s our soul/higher self, which exists in the higher frequencies only, the “5D reality and upward”. When we meditate, we align more and more with the soul self, retiring from the density of the “3D reality”. This is one of the reasons meditation is so beneficial in raising our emotions and our energy vibration. Both the shadow/ego and higher self are are “us”, but they exist on different “channels” of reality and we’re not always aware of them. We are all one person, so to speak, but there are different aspects of us existing on different “channels” simultaneously. This is how your Twin’s higher self can be immaculately loving and joyous even though their earthly ego self is experiencing negativity and stress. I was asked to bring forth a message from the souls of those Twins who are running, hurting or avoiding their divine complement in earthly life. The message is that no matter what any earthly sides of the person is going through, your Twin Soul’s higher self has only immaculate, unconditional love and affection for you. The more you learn to trust them and open up to the radiant love they offer, the more they can help you up into harmonized vibrations with your Twin Soul on *all* levels, in the physical “ego” domain as well. Ask your Twin Soul’s higher self to connect with you, ask them to show that you can trust them, ask them to help you understand and remedy anything their lower ego aspect is going through, ask them to lift you up with proof of the love they really feel for you and to remind you of your eternal connection and their devotion to you. It can be disheartening to see the person you feel electric love for and whose connection with you has changed your whole life, be cold or uncaring or directly hurtful towards you. Often, it feels crushing to people because they still feel the love beneath it all. This is why it’s nigh impossible for a Twin Flame to just let the other go and move on with their lives. To connect with your Twin Flame’s higher self will be such a comfort and they can truly help you, both for your personal happiness and with your journey. Enjoy this immaculately positive side of your Twin Flame connection! No matter what, your Twin’s Higher Self is there for you – in all ways, at all times. You and your Twin Flame planned your lives ahead of time. You agreed to come here. You made sure that you would be born with the capability to come together in love, or that you would learn and gather tools along the way. You knew there might be challenges along the way, but you were so confident in the love you share that you knew it would survive anything. You didn’t come here to suffer – the world is full of enough suffering, and that’s because of the web of old collective energy and lower ego consciousness. In fact, Twins are here to be an antidote to the human suffering that already exists, to help move AWAY from that and back to love. At the core of the Twin Flame connection, there is love. The Drama is the illusion. That’s just what the Ego sees. Conflict is part of the old 3D illusion. It’s easy to feel that we have no control over this journey and that things are slipping out of our hands when pain or negativity arises. The truth is that we as souls have more power in this than we might realize. And once we align with our inner power instead of dwelling in feelings of victimhood, taking action to clear the hurt and uplifting ourselves, our energy field changes and we begin to open up our journey in a completely different way. Don’t let the 3D Twin Flame stories of illusion (no matter how well intended and well described) dictate your journey – go deeper. Listen to your soul’s wisdom and that which stirs it, resonates with it, ignites it. It will never steer you wrong. So what’s the next step on your path? Feel inside, let your soul show you. You’ll recognize it by the feelings of lightness, love, joy, inspiration.